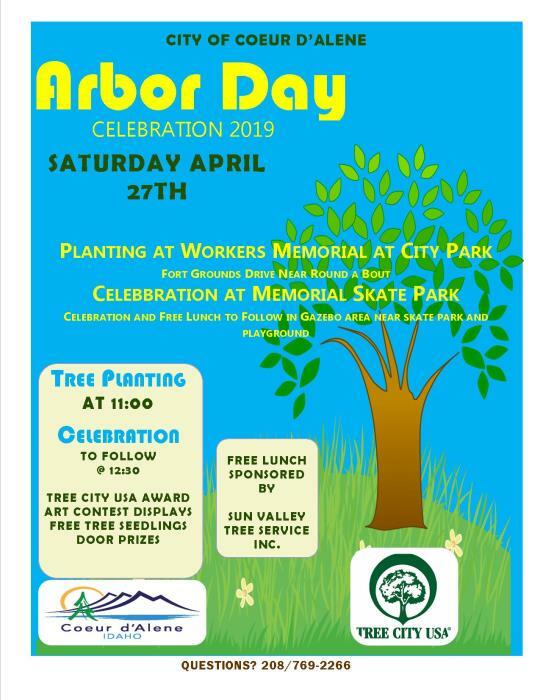 Idaho's Arbor Day is the last Friday in April - April 26th in 2019. City Park and Memorial Skate Park. Coeur d'Alene has received it's 35th Tree City USA Award! Arbor Day Button Art Contest – Middle School and High School students are invited to submit artwork for the annual Arbor Day button. The contest announcement will be available in February and the art submissions are due by early March. The winning artwork is put on buttons that will be distributed to fourth grade students and at several Arbor Day events. Arbor Day Poster Contest – Fifth grade students in Coeur d’Alene will receive information about this contest through their schools. The winners will be recognized at Coeur d’Alene Arbor Day Celebration or another public event. Seedlings for Fourth Grade students – The fourth grade students in the Coeur d’Alene, Post Falls, and Lakeland school districts receive free tree seedlings for Arbor Day. The seedlings are purchased with donations from local forest products companies, tree services, and nurseries. They are individually packed and tagged by volunteers and distributed by volunteers and urban and community foresters. Seedlings at the Library– Seedlings are given out at several children’s programs at the Coeur d’Alene Library during the week leading up to Arbor Day.